Let’s begin with why I strongly dislike (only because it’s not nice to say HATE) ocean cruises: seasickness; queuing up with thousands of peeps who all seem to be vying for the “how-high-can-I-load-my-plate-with-mediocre-food-from-the-buffet-table” award; long, boring days of bobbing around the high seas with nary a speck a land in sight; wasted hours getting off ship at each port and then having to drive long distances to get to to town-repeat for return to ship, having to fork over additional big bucks for ‘canned’ shore excursions, being reduced to watching Vegas wanna-be entertainment, etc. 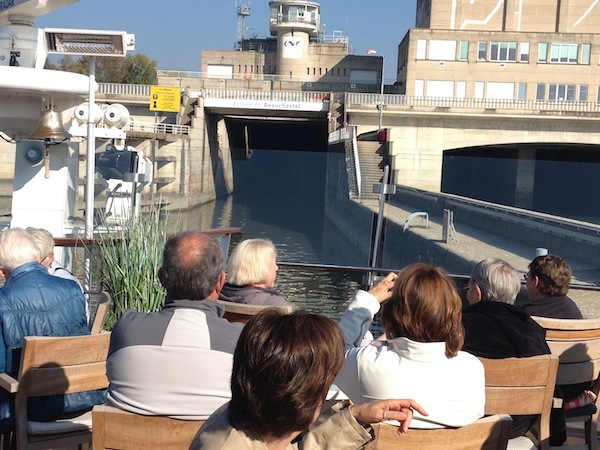 Which is why I wasn’t all that excited about going on a European River Cruise. However, since river cruises are now the hottest thing since salty caramel and bacon gelato, I thought I should give them a try. 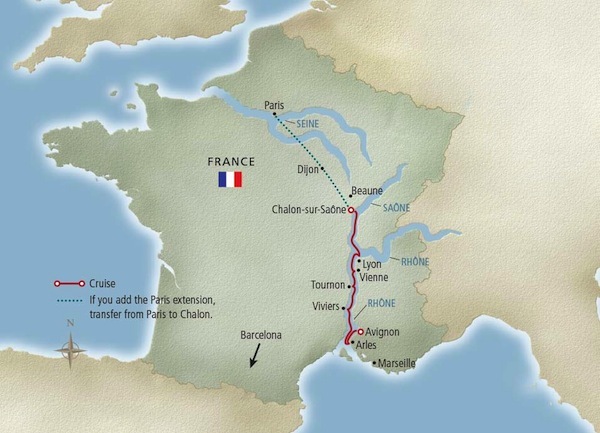 I invited my besty, Joan, to join me for a girlfriend getaway on Viking’s Portraits of Southern France-Avignon to Chalon. I figured that if all else failed, at least we could get drunk on good French wine. 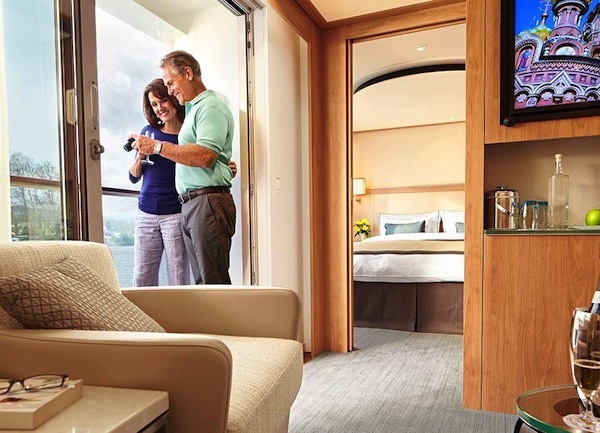 Although I’ve been a little slow to “Discover the world of Viking”, the largest river cruise line in the world, their aggressive expansion plans give Sbux a run for their money. Last year, they set a Guinness World Record by christening 18 new river ships in one week, and this year they will be adding 10 more European Longships to their fleet. From the second we stepped on board the brand-spanking new Hermod and were greeted by the ever gracious and dapper Hotel Manager, Thomas Koessler and the effervescent Julian Mattocks, our fun-loving yet exceedingly efficient Program Director, with a warm welcome, a refreshing moist towel and a cool drink, we were treated with unfailing hospitality. 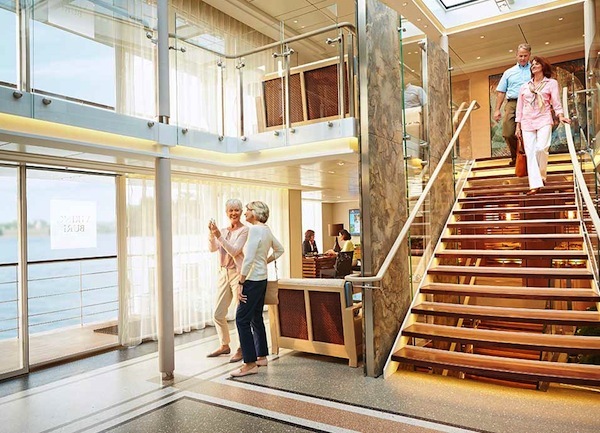 Next, I was struck by all the bright shining glass–better to show off the breathtaking riverscape views–from the glass-enclosed, two-story atrium, to the indoor/outdoor terraces with retractable doors, to our stateroom’s floor-to-ceiling sliding glass doors, which opened to our private veranda. 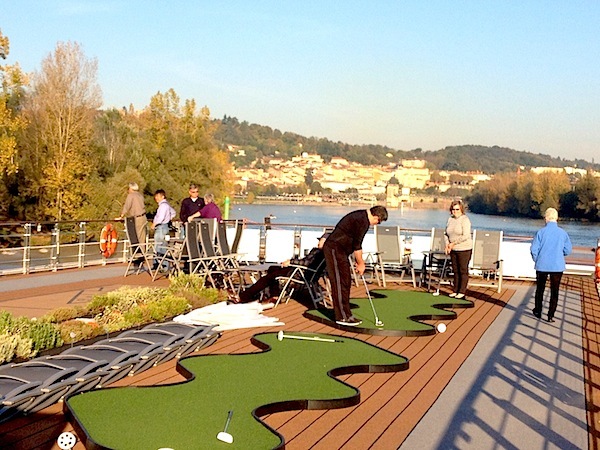 Other unique touches included an organic herb garden, solar panels, a putting green, walking track and a helpie/selfie espresso bar. The main dining room, like the rest of the ship, sparkled from the light streaming in from the oversized windows-perfect for eye-dropping on the locals as they went about their daily life or marveling at the vivid countryside, sprinkled with picturesque medieval villages, lush hillside vineyards and vibrant lavender fields. Fresh flowers graced the crisp white linen covered tables set for four to ten, and seating is open. Every waitperson we had was delightful- smiling, happy, and eager to please. The majority of the staff came from Eastern Europe and loved talking with you about their country. For breakfast you can belly-up to the lavish buffet for fresh fruit, yogurt, fabulous French cheeses, meats, assorted pastries, bagels with cream cheese and smoked salmon, hot & cold cereals and/ or make a pit-stop at the made-to-order omelette station , where happy-go-lucky Chef Daniel was happy to whip me up an egg-white, oil-free, veggie and brie scramble if I woke up feeling particularly health-conscious. There was also a more elaborate menu you could order from, that included waffles and eggs Benedict. The lunch buffet was small but tasty, and included a soup and sandwich bar, pasta, assorted salads and desserts. There was always a wide selection of fresh fruits and veggies on hand if you wished to eat lightly. Fortunately for me, I did not find the pastries to be particularly compelling, so I was able to skip the sweeties most days, preferring to indulge in a ridiculously creamy Saint-Marcellin or earthy Camembert cheese. 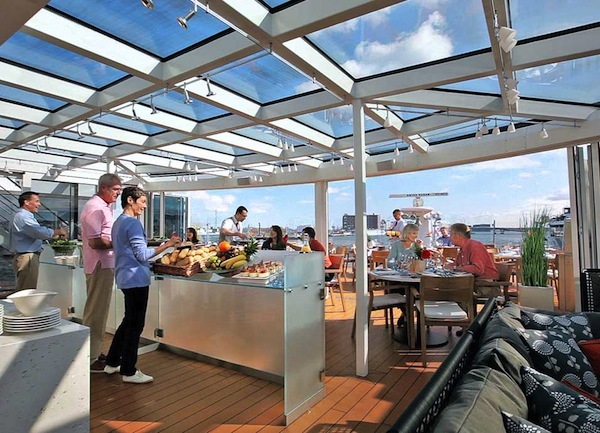 On sunny afternoons, we would dine al fresco at the more casual Aquavit Terrace. Sit-down dinners featured a full menu with hot or cold apps. The no-attitude waitstaff never batted an eyelash if I asked to try two or three of them. Entrees included a fish, meat and vegetarian option. My chocoholic buddy, Joan, was thrilled that there was always a choco selection available amongst the dessert choices, and pronounced the hot chocolate soufflé as one of the best ever. Complimentary regional wines were generously poured during lunch and dinner, or the staff was happy to open a bottle you picked up while on shore, free of corkage fees. We were totally satisfied with the complimentary wine choices. One afternoon, when I mentioned to our knowledgeable sommelier, Gabor Simon, that I didn’t particularly like the Chard, he whisked it away and replaced it with a spritely Sauvignon Blanc. For an additional fee there is also a Silver Spirits premium beverage program. The European trained culinary team (our talented Chef de Cuisine Jevgeni Passenko was from Estonia) would often add their twist to the regional specialties, using local ingredients. There were the usual special meals, including a Captain’s Welcome and Farewell Reception, afternoon teas and the final gala dinner, but for sheer fun, the Taste of Provence Dine-around was a blast! Stations were set up all over the ship, even in the galley, where we could run up and downstairs, sampling yummy local delicacies. This could best be classified as “entertainment-light,” since there was not a huge selection of activities to choose from. What they had was top-notch and mostly revolved around helpful informative talks on different facets of the local culture. There were presentations on silk-dying, educational lectures on fabled wine regions, cheese tastings, and much to Joan’s delight, a chocolate cooking demo by Chef Jevgeni. He showed us how to make an idiot-proof “Fondant au Chocolat” that could be easily adapted for brownies, soufflé or even a gluten -free version. There was a nightly piano player and even a few game nights, which I normally dislike intensely. However, I have to admit that when we got roped into a game of “Majority Rules”, which we were only going to scope out for five minutes, but due to the infectious enthusiasm of our Program Director Julian, Joan and I got totally caught up in the excitement and duked it out until the bitter end…where we scored this close to first place! Our favorite mode of entertainment, which came as a huge surprise, since every night we would say to each other, “Let’s just sit at a corner table so we don’t have to make polite chitchat with anyone,” turned out to be talking with the other guests. The bulk of travelers were Americans, followed by Canadians, Brits, some Aussies and New Zealanders, with ages starting around 55 years old up to infinity. In general, the guests were bright, sophisticated, well traveled, and one of the most courteous and congenial groups of random people I’ve ever traveled with. At dinner the last night, Joan and I shared a table with a top OBGYN (who had delivered over 5,000 babies) a renowned child physiologist, two exceedingly wealthy couples who could not have been more down-to-earth (I googled them later and we are talking major bucks), where we engaged in a lively debate on what was the best song of all time, since we had found out the answer at game night. Admittedly, they had a lot to work with on this one, so it would be really hard to mess up. 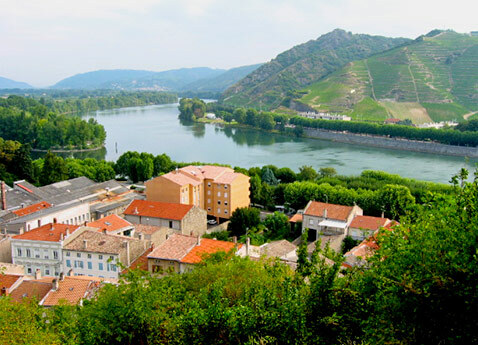 What self-respecting foodie, wine connoisseur history buff, art-lover or just all-round Francophile wouldn’t love this eight day cruise that starts in the historic city of Avignon, crisscrossing the Rhone and the Saone Rivers, then ending nine destinations later in Chalon-sur-Saone. 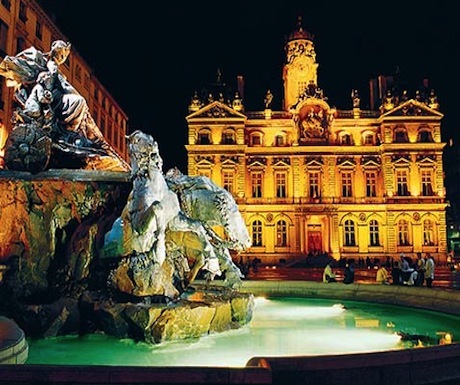 Stops include three UNESCO World Heritage Sites; Roman ruins in Arles, wine-centric Tain-l’Hermitage, Beaune, the wine capital of Burgundy, and Lyon, one of the all-time great food destinations. At least one complimentary guided tour was included each day, as well as optional shore excursions that were available for an additional fee. These were all led by friendly, knowledgeable guides. I loved that they always offered one “gentler” walk for those who wanted to take their time without delaying less patient peeps like me, and also the high-tech audio headsets, so you could hear everything the guide was saying even if you wandered off slightly. Since our ship always docked right in town, we usually opted to take one tour to get our bearings and then would wander about on our own, often staying in town to try a local restaurant. This was an at-your-own-pace orientation day, since guests were arriving throughout the day. We strolled down the cobblestone lanes, stocking up on Provencal lavender gifts, including infused honey, cookies, soaps and fragrant sachets, which helped eliminate our jetlag when tucked under our pillows. We took a quick peek at the exterior of the humongous Papal Palace, since we knew we were coming back later. Our ship was docked close to the famous ‘Pont de Avignon’. 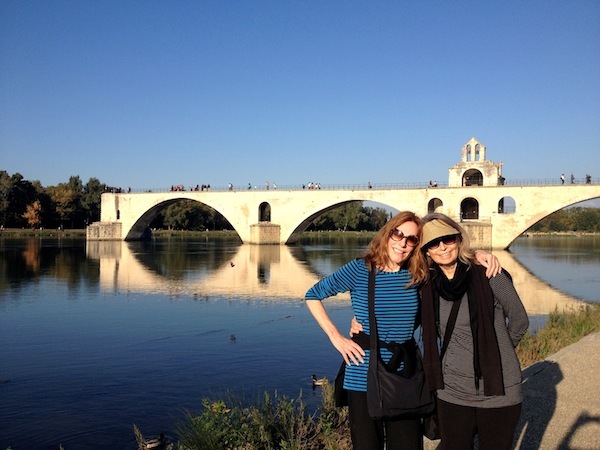 I had to teach Joan the song lyrics to “Sur le Pont d’Avignon.” Little did she know that after the first line, I was just making up French sounding words! This UNESCO World Heritage Site is filled with Roman ruins; the most impressive is the beautifully preserved Les Arènes, a 20,000-seat amphitheater, where gladiators once fought to the death. Arles is also known for having welcomed Van Gogh during a particularly turbulent period in his life. Inspired by the distinctive landscape, strong sunlight and bright colors, he spent his final years here, producing what many critics believe were his finest works. 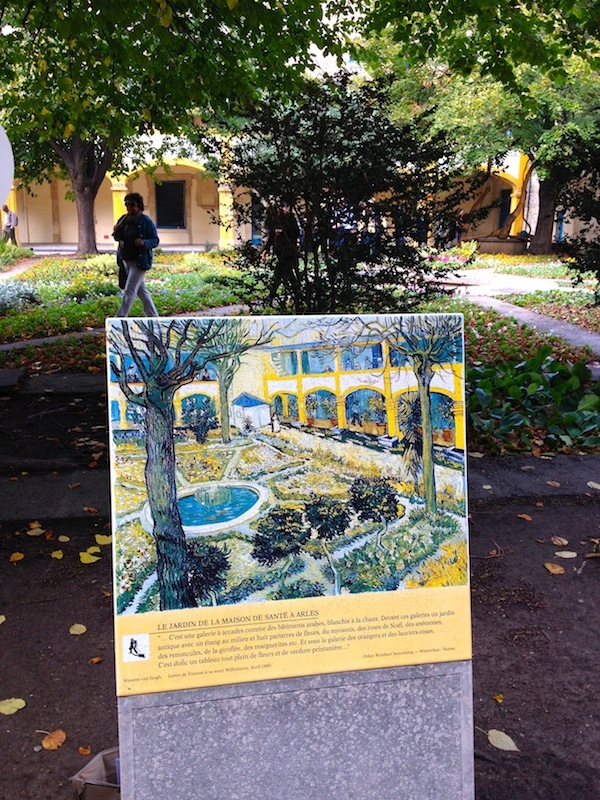 We visited several real-life locations that he painted, including Espace Van Gogh, the hospital where Van Gogh was taken after he cut off his ear in 1889, as well as the yellow café pictured in his “Café de Nuit” (Night Cafe). 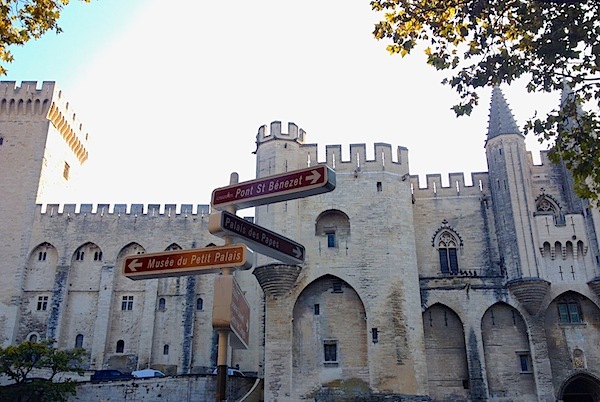 Back to the fortified town of Avignon for a full-fledged tour of the 14th century Papal Palace, the largest Gothic palace in the world. 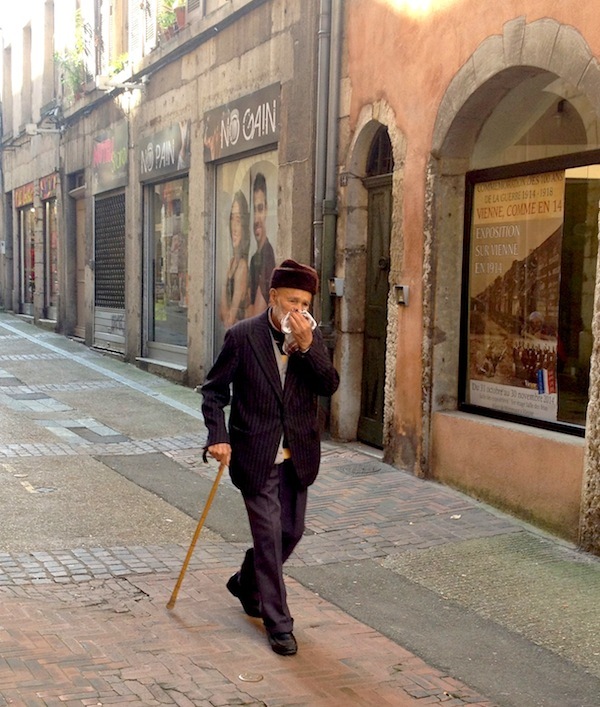 This time, we went inside the private papal apartments, filled with magnificent Italian frescos. We marveled over the sheer magnitude of the humongous dining room, where guests had once celebrated the 1344 coronation of the Pope, with a meal consisting of 7,428 chickens, 1,023 sheep, 95,00 loaves of bread, etc. and 42,000 gallons of wine. Our next stop was Les Halles, a rustic covered market, lined with rows of food stalls piled with fresh fruit, veggies, pristine seafood, herbs, olive oil, and authentic Provencal specialties. In front of the food market was a colorful flower market, as well as a rambling antique fair. After hearing the menu for the Pope’s dinner, we were ravenous, so Joan and I stayed at the market for an impromptu lunch of fresh-shucked oysters, garlicky steamed mussels, a crusty baguette and wine. 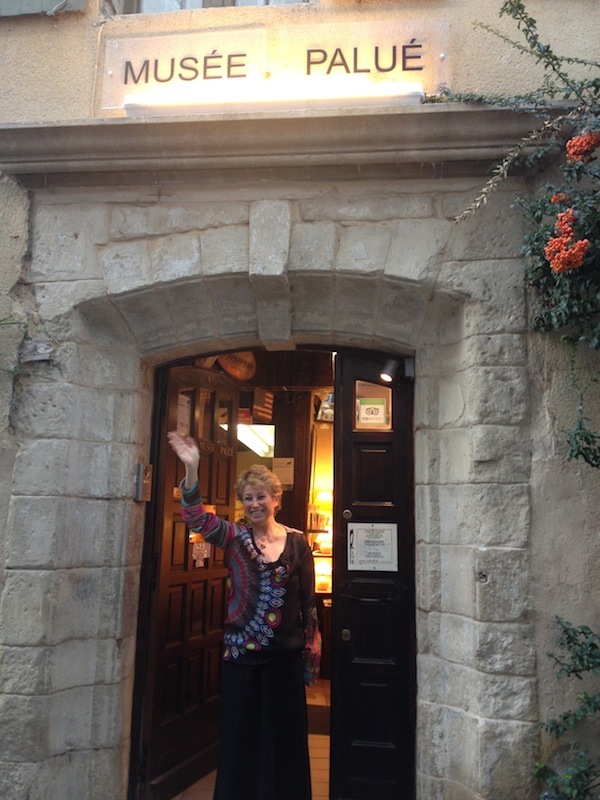 We made it back to the ship, albeit happily tipsy, just in time to join the tour to the Chateauneuf-du-Pape wine region. 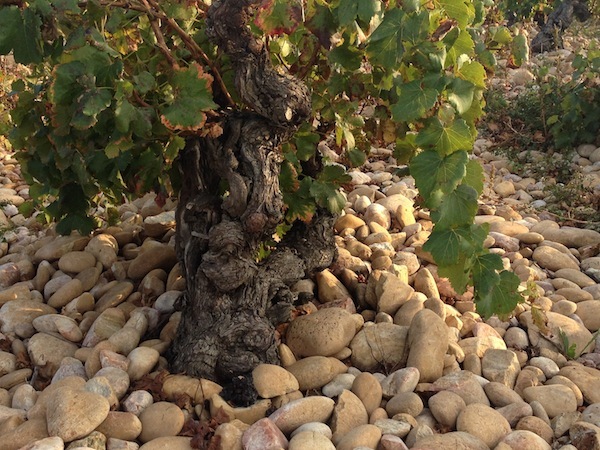 We visited some stony vineyards (one of the secrets to making an outstanding Châteauneuf-du-Pape wine) and stopped for an informative tasting of these esteemed wines. We then were cut loose to wander through the one-trick pony, medieval village of Châteauneuf, where almost every shop had something to do with wine and the majority of them offered free tastings. Thankfully, we didn’t have to drive home! 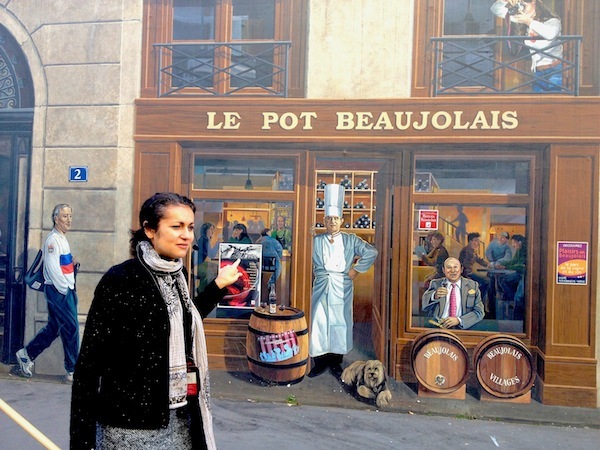 Today was a triple-header, filled with art, wine and chocolate, as we explored the fraternal twin towns of Tournon and Tain L’Hermitge. First stop was in the heart of a top wine-producing region, Crozes Hermitage, where we toured and tasted some excellent Rhône Reds at extremely reasonable prices. Then on to Joan’s version of heaven, a tasting at Valrhona chocolate headquarters, viewed by many as the world’s best chocolate. Once I heard we could indulge in as many free samples of chocolate (including a cup of their exquisite hot chocolate) as we wanted, I felt like… a kid in a candy story! The only thing that would have made it better was if we had visited there first, so we could have enjoyed some of our samples paired with the lovely red wines. We ended with a fascinating visit to the Musee de Tain L’Hermatage, where the delightful daughter of noted French painter Pierre Palué welcomed us to her painstakingly restored 16th century home, filled with a prolific collection of Palué’s impressionist paintings. I had been waiting all week to visit this foodie Mecca. This remarkable 2,000-year-old town is now home to approximately 2,000 restaurants, with 22 of them sporting Michelin stars. Sure, they also have a magnificent Basilica filled with intricate mosaics, a plethora of world-class museums including the Musee des Beau-Arts, a protected historic old town which had once been the center of the silk industry and a newly revitalized river bank district, lined with eye-popping industrial chic buildings and trendy art installations, but I was there first and foremost for the food. 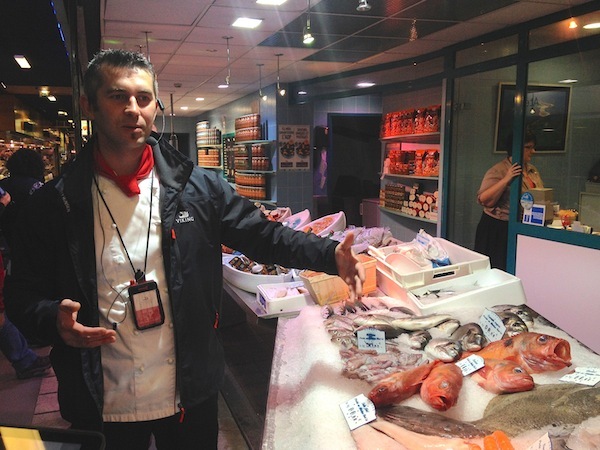 Who better to show us around than our own Chef Jevgeni, who conducted a culinary tour of the exalted Les Halles de Lyon-Paul Bocuse? I don’t know which us was more entranced with the glamorous food market offerings that afternoon. I waxed euphoric over the foie gras macaroons, while Jevgeni was bouncing around, pointing out (and scoring us samples) of the best local breads, cheeses, pates, sausages, and chocolates, all the while rattling off cooking tips so fast I could barely write them all down. 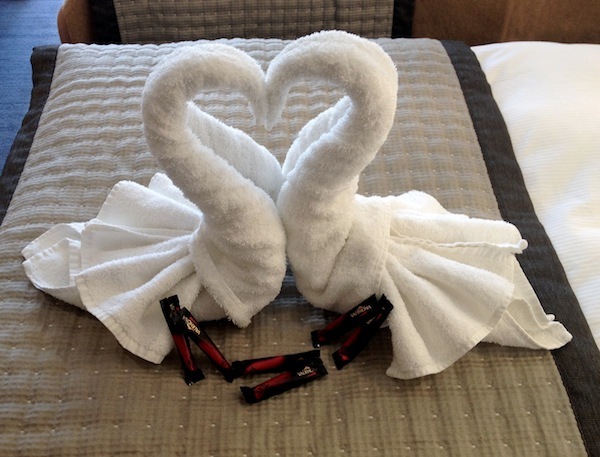 Joan and I had made reservations at the Michelin-starred Les Loges restaurant that evening. This had prompted some lively debates between us, since we only had one night to eat in Lyon and everything hinged upon making the right selection. Needless to say, I won…and I nailed it! We were completely enthralled once we entered the 5-star Cour des Loges hotel, a unique blend of four impeccably restored Renaissance homes (the oldest dates back to the 14h century) surrounding a dramatic glass -roofed arcade-the largest in Lyon-which housed Les Loges. The imaginative presentation of our five + course Chef’s dinner paired perfectly with the dramatic setting, as we dined in a sumptuous candlelit Florentine courtyard under arched loggias and sparkling crystal chandeliers. Chef Anthony Bonnet’s well-crafted dishes were simultaneously fun and inventive, yet with a touch of sophistication. The highlights for me were Duck foie gras with roots cooked in an oragen, and the traditionally bred pigeon served with crunchy bread and spicy fruits, although Joan was besotted with the Grand Cru Chocolate dessert. The your-wish-is-my-command, unobtrusive service combined with exciting wine pairings provided an unforgettable evening. As wonderful as our week was, Viking really did save the best for last. Patrick had found out the night before that the optional excursion to the Great Abbey of Cluny had to be altered, since we couldn’t enter it for reasons beyond their control. 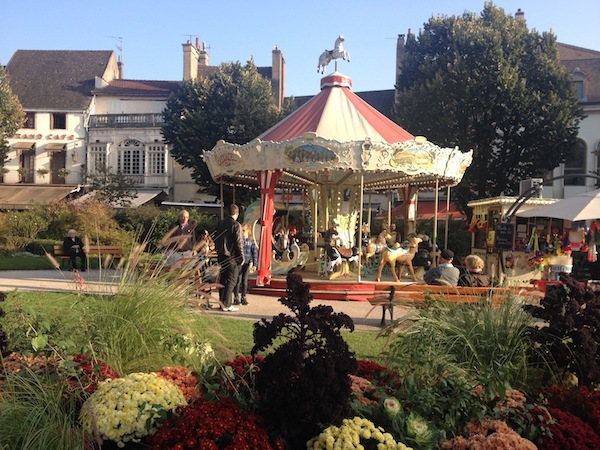 Not only did they change the itinerary, for a much better one as far as I was concerned, since we still got to see the outside of the Abbey, and they added two additional stops; shopping at the bustling Cluny farmers’ market, as well as a fascinating tour of the Château de Cormatin. The Château was an impeccably restored early seventeenth century castle, complete with a moat, drawbridge, turrets, gun ports, and stunning gardens. The magnificent rooms, filled with priceless works of art, museum quality tapestries and breathtaking carved gilding, transported you to the life and times of early French nobility. To make up for any “inconveniences” due to these changes, in typical Viking lagniappe style, they even refunded us 50% of the tour cost. That afternoon, we visited the charming town of Beaune, wine capital of Burgundy, where we toured the iconic Hôtel-Dieu des Hospices de Beaune. This colorfully tiled Gothic hospital is now a museum that provides a fascinating window into healthcare in the 1400s, where patients were housed in huge dorms and slept two to a bed. One final wine tasting of Beaune’s legendary wines, and then we forlornly headed back to the boat to pack up for our departure.